Notts Prayer Network is made up of Christians who pray for the city of Nottingham and county of Nottinghamshire in local prayer groups or as individuals. We hold monthly Trumpet Call meetings to pray and praise God and for teaching and encouragement. The Prayer Network also partners with local ministries, providing prayer support. Prayer for the city of Nottingham and the county of Nottinghamshire has been taking place in many ways over many years. We dedicated this city to the Lord in January 2000 in a millennium celebration in the Market Square, with about 6,000 people, including officials of both church and city. 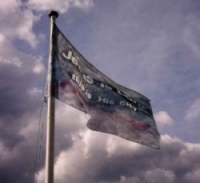 During Easter of the same year (2000), there was a Christian celebration at the castle when a flag was raised on the castle flag-pole which declared, ‘Jesus is Lord, this is His city’. 2003-2004 was a period of laying down the old ways of doing things and the strategies that God had previously given in preparation for the ‘sounding of the trumpet’. God was calling us to Himself. Since January 2005 we have met together in response to the sound of the trumpet and this impacts every part of the prayer network. To find out more about the history and journey of the Notts Prayer Network, click here. Copyright © 2019 Nottinghamshire Prayer Network. All Rights Reserved.